I’ll sneak in a few in progress shots of my latest work. The first is a underbust Victorian corset done up as a Christmas gift. 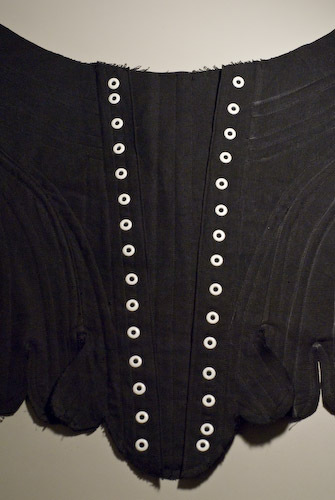 The second is a mock-up of a rounded,center opening variation on the pink stay seen in my corsetry gallery. The final stays will be done in a scrumptious purple silk. You can see the tape holding the white thread in place until I can pull it though, knot, and tucks the ends inside so they are hidden. I don’t normally do mock-ups in black or with white eyelets! The center front is not meant to close all the way but designed to have a pleasing “v” pattern in the lacing.